Taken as a treat!! You're dog will love these! 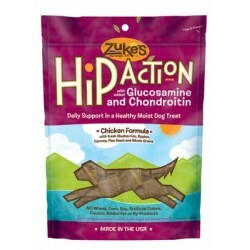 New - Zuke's Hip Action® in 1 lb. resealable bags. ..
Taken as a treat!! You're dog will love these! Hip Action is now available in CHICKEN! As always, ..
Peanut Butter Hip Action® Treats, 1 pound Pouches - Natural Relief in a Healthy Treat with Glucosami..
NUTRI-VET PROBIOTICS contains a patent-protected blend of "friendly" bacteria beneficial in maintain..
NUTRIVET WILD ALASKAN SALMON OIL provides levels of both omega-3 and -6 fatty acids (EFAs) not commo..